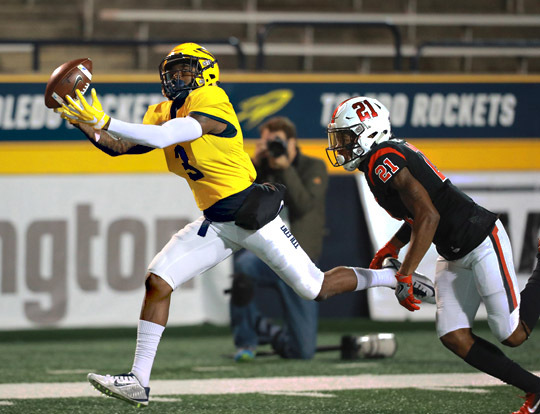 Sophomore Eli Peters led the Rocket offense to 531 yards of total offense, but it was the Toledo defense that shined most in a 45-13 victory over Ball State in the Glass Bowl Wednesday night. The Rockets forced five turnovers, including a forced fumble that was recovered for a touchdown, in leading UT to victory over its West Division foe. Toledo also had four sacks and limited the Cardinals to just 94 yards rushing in 35 attempts. Defensive tackle Willie Ross held up the ball after recovering a fumble on Ball State’s 31-yard line. Peters, stepping in for the injured Mitchell Guadagni, completed 25 of 34 passes for 327 yards and two touchdowns. He had three first-half interceptions, but settled down in the final 30 minutes, guiding the Rockets to victory in Guadagni’s place for the second time this season. Sophomore Art Thompkins led the rushing attack with 84 yards and one touchdown, while redshirt freshman Bryant Koback added 78 yards and two scores. Senior wide receiver Cody Thompson had six receptions for 75 yards and one TD, while junior Diontae Johnson chipped in with five grabs for an even 100 yards. The defense was led by junior safety DeDarallo Blue and junior linebacker Jordan Fisher, each of whom had seven tackles. Freshman defensive end Terrance Taylor had three tackles for loss for 28 yards, and senior linebacker Richard Olekanma added two tackles for loss. 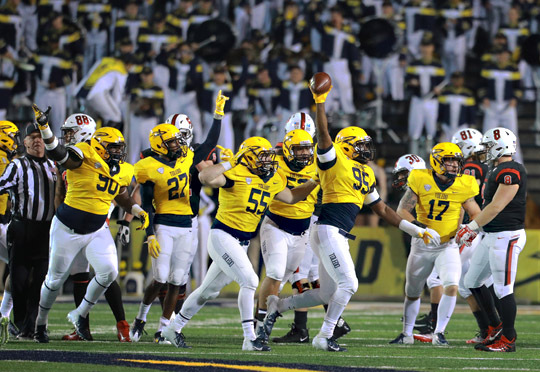 The victory keeps Toledo (5-4, 3-2 Mid-American Conference) in the race for the MAC West title behind Northern Illinois (4-0) and Western Michigan (4-1). Junior Diontae Johnson had five receptions for 100 yards. Toledo jumped out to a 21-0 lead in the opening quarter. The Rockets took advantage of a turnover on Ball State’s first possession and converted it into seven points. Willie Ross recovered a Cardinal fumble on the BSU 31-yard line, and the offense marched 69 yards in the other direction to take a 7-0 lead. Bryant Koback finished off the drive with a 19-yard TD run up the middle. Moments later, Diontae Johnson weaved his way downfield for a 57-yard gain on a short reception to the BSU 20-yard line. Two plays later, Art Thompkins rolled in from one-yard out to make the score 14-0 with 8:25 left in the first quarter. The defense struck again when freshman defensive end Terrance Taylor strip-sacked BSU quarterback Drew Plitt on the Cardinal 16-yard line. Senior defensive endTuzar Skipper ran down and recovered the ball just as it crossed the corner of the end zone for a touchdown, giving the Rockets their third score in the first seven-plus minutes of the contest. 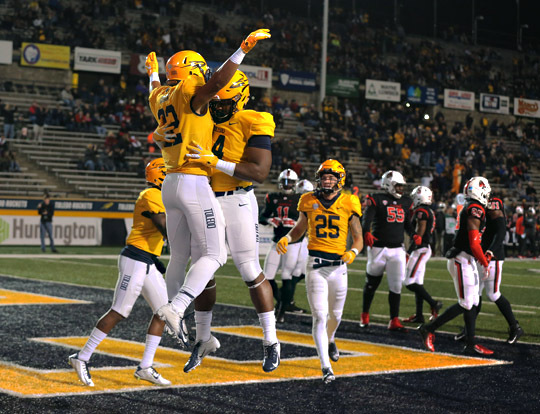 It was a treat for Rocket fans on Halloween night as Toledo celebrated frequently in the end zone. Ball State got on the scoreboard following an interception on its own 30-yard line late in the first quarter. A flurry of mid-range completions from Plitt moved the Cardinals quickly down the field to open the second period, culminating in an 18-yard TD pass to Riley Miller to trim the Rocket lead to 21-7. The two teams then traded interceptions, the Rockets’ pick coming from redshirt freshman Zach Ford deep in UT territory. The Rockets then traveled 81 yards in 10 plays, Koback finishing it off from three yards out for his second TD of the contest. Neither team could sustain a drive for most the third quarter, with Toledo’s first possession ending in a Cardinal interception in the end zone and Ball State’s with a sack. The Rockets finally broke through with a 29-yard field goal from Jameson Vest near the end of the period. It was Vest’s 69th career field goal, breaking the Toledo record and giving UT a 31-7 edge heading into the fourth quarter. The Cardinals scored on their first possession of the fourth quarter, finishing off a six-play, 75-yard drive with an 11-yard TD run by Mailk Dunner. The two-point conversion attempt failed, making the score, 31-13 with 13:12 to play. Toledo answered quickly, as senior wide receiver Cody Thompson snagged a horizontal throw from Peters, then bolted 23 yards down the sideline to make the score, 38-13. UT finished up the scoring with a 41-yard TD pass from Peters to sophomore Bryce Mitchell. The Rockets next hit the road to play at MAC West leader Northern Illinois in a showdown in DeKalb Wednesday, Nov. 7. 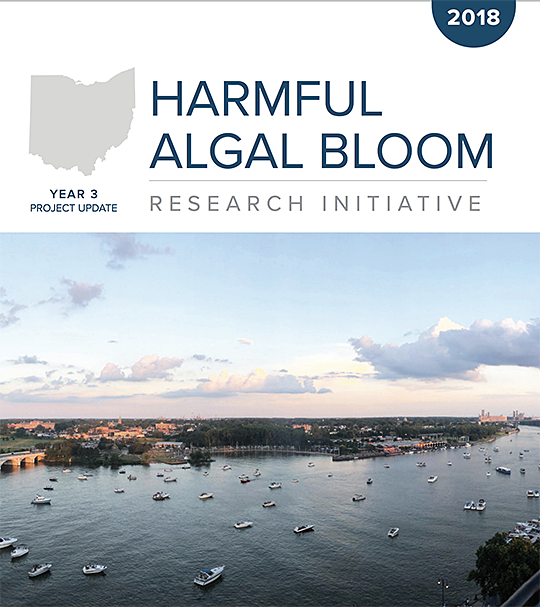 Ohio Sea Grant released today its 2018 update on the statewide Harmful Algal Bloom Research Initiative (HABRI) documenting three years of progress seeking solutions for harmful algal blooms in Lake Erie. The University of Toledo, situated on the western basin of Lake Erie, is one of the lead universities in the initiative, which consists of more than 50 science teams from 10 Ohio universities working on critical knowledge gaps identified by state agencies that include the Ohio Environmental Protection Agency (OEPA), Ohio Department of Agriculture, Ohio Department of Health and Ohio Department of Natural Resources (ODNR). The initiative is funded by the Ohio Department of Higher Education and matching funds from participating universities. It is led by UT and Ohio State University. The 38-page report features a variety of important research activity underway by members of the UT Water Task Force to protect the public water supply and public health, including Dr. Tom Bridgeman’s work to understand the vertical movement of algae up and down the water column to help water treatment plant operators better prepare for and reduce the amounts of algae they’re taking into their system over the course of a day, as well as Dr. Jason Huntley’s research using naturally occurring Lake Erie bacteria to develop treatments that can break down microcystin in drinking water. Bridgeman is professor of ecology and director of the UT Lake Erie Center. Huntley is associate professor in the UT Department of Medical Microbiology and Immunology. • Early warning systems and forecasts of bloom size and location are giving water treatment plants a high-resolution picture of what could be affecting the drinking water they draw from Lake Erie. • Researchers are working directly with water treatment plant operators to provide practical guidance about producing safe drinking water for cities and towns dealing with algal toxins. • OEPA modified its permit procedure to better safeguard Ohioans when HABRI projects showed that crops might take in microcystins from water treatment residuals used on farm fields. New HABRI research is helping OEPA refine the methods it uses to analyze these byproducts of water treatment and better assess exposure risk. • OEPA sought out HABRI researchers to help develop a Lake Erie open water impairment listing policy, and HABRI projects have helped collect data critical for refinement of this indicator. Ohio EPA listed the open waters of the western Lake Erie basin as impaired based on National Oceanic and Atmospheric Administration data and have plans to update it based on HABRI researchers’ recommendations. • ODNR has changed the way that information is collected on algal toxin concentrations in sportfish fillets, sampling more frequently during the harmful algal bloom season and from a wider range of Lake Erie locations to better understand how harmful algal blooms affect sportfish. • HABRI has driven information sharing and priority setting between universities and agencies, positioning Ohio to better prevent and manage future crises through ongoing collaborations. The Ohio Department of Higher Education made $7.5 million available for four rounds of research funding (before matching funds by participating universities) since 2015. Ohio Sea Grant manages the projects, which also include a $500,000 match from OEPA in 2018. Results from the most recent 21 funded projects are expected in 2020. Information about HABRI projects, as well as partner organizations and background on the initiative, is also available on the Ohio Sea Grant website. The report can be downloaded directly at ohioseagrant.osu.edu/p/qjpof/view. The Ohio Sea Grant College Program is part of the National Oceanic and Atmospheric Administration Sea Grant, a network of 33 Sea Grant programs dedicated to the protection and sustainable use of marine and Great Lakes resources. For more information, visit the Ohio Sea Grant College Program website. The number of graduates from The University of Toledo College of Law who passed the July bar exam in Ohio on the first try is well above the state average. The newly released data shows the first-time passage rate for UT law graduates taking the bar exam is 84 percent, up from 74 percent last year in July. The state average in Ohio this year is 79 percent. The UT College of Law is committed to preparing students for a successful career with programming and partnerships dedicated to bar passage. In the last few years, the College of Law aligned its curriculum to bar-tested subjects, developed a new first-year support program, expanded its third-year bar prep course, and implemented a legal analysis course and academic success contracts. The UT College of Law also created the position of director of academic success and bar preparation. This position held by Lesa Byrnes oversees the Bar Passage Program that is designed to prepare both third-year students and graduates for the bar exam. Through post-graduation mentoring, every UT law graduate is paired with a faculty mentor to provide support during bar exam study. Most recently, the UT College of Law partnered with BARBRI, a company headquartered in Texas, to offer student access to its comprehensive bar review course with flexible classroom, online and mobile learning environments. It’s not something you see every day: A baseball player striding to the Rocket logo in the center of the Glass Bowl and hitting it out of the stadium. But that’s exactly what Josh Johnson did. 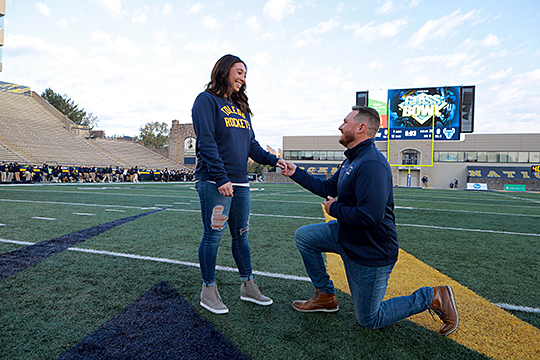 With the help of Rocky and Rocksy, the former UT outfielder surprised his girlfriend, Cara Wasserman, by popping the question Oct. 20 and sliding a diamond on her finger. Cara Wasserman and Josh Johnson held the UT blanket while posing for a photo with Rocky and Rocksy after the couple became engaged Oct. 20 in the Glass Bowl. At 8:30 a.m. on game day, the couple met their friends, Eric and Neena Mossing, in lot 10. 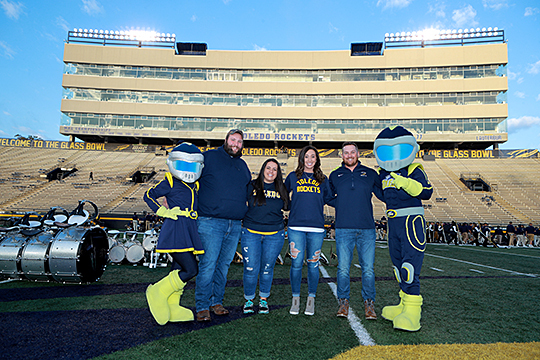 “We played it off as a contest, that Neena and Eric won passes to tour the Glass Bowl, and they asked Cara to go as she’s a huge Toledo football fan,” Johnson said. Johnson dropped down on one knee and opened a ring box. 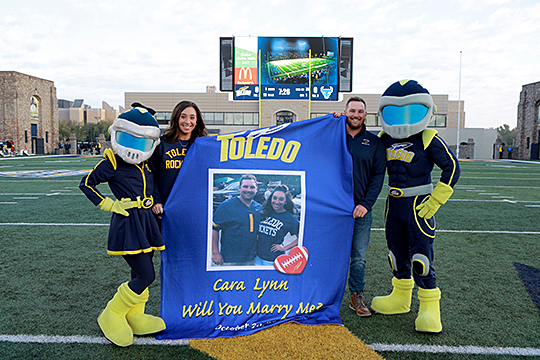 Josh Johnson surprised Cara Wasserman when he knelt down and asked her to marry him prior to the Oct. 20 Toledo football game. And when she saw the blanket? Keeping the plan under cover was easy for Johnson — until Saturday morning. “She kept pushing the snooze button, and I kept looking at the clock,” he said. “I basically pushed her out of bed so she’d get up. And then on the drive there, it started to hit me quite a bit. Most times, I’m not really driving that fast, but I felt like I was going 85 miles per hour to get there. Rocksy and Rocky posed with, from left, Eric and Neena Mossing, Cara Wasserman and Josh Johnson. This shot of the “contest winners” was taken before the proposal. Johnson started planning to ask the big question in the spring. “With her dad being a former football player, she grew up a huge Rocket fan. And being a former UT athlete myself, with the last home game on a Saturday, that was the perfect time,” he said. Johnson played baseball for the Rockets from 2007 to 2010 and graduated with an individualized degree from University College in 2014. He is the recreation program specialist at the Village of Archbold’s Department of Parks and Recreation. Wasserman received a bachelor of education degree in 2011 and is an intervention specialist in special education and math teacher at Fassett Junior High School in Oregon. She is pursuing a master of education degree in curriculum and instruction at the University. They are looking for a home in between Archbold and Oregon, and discussing wedding plans for next year. 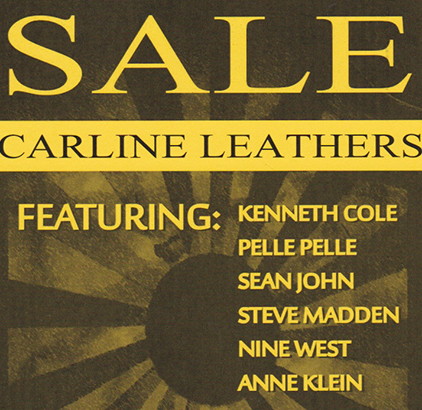 The Satellites Auxiliary’s Carline Leathers sale will start at 7:30 a.m. Thursday, Nov. 1, and run continuously through 3 p.m. Friday, Nov. 2, in UT Medical Center’s Four Seasons Bistro Atrium. Fashion outerwear, footwear, handbags, accessories and more from Kenneth Cole, Pelle Pelle, Sean John, Steve Madden, Nine West and Anne Klein will be for sale. A portion of the proceeds will patient programs. The Satellites Auxiliary is a volunteer group designed to promote education, research and service programs; provide support of patient programs in accordance with the needs and approval of administration; conduct fundraising events; and provide services. 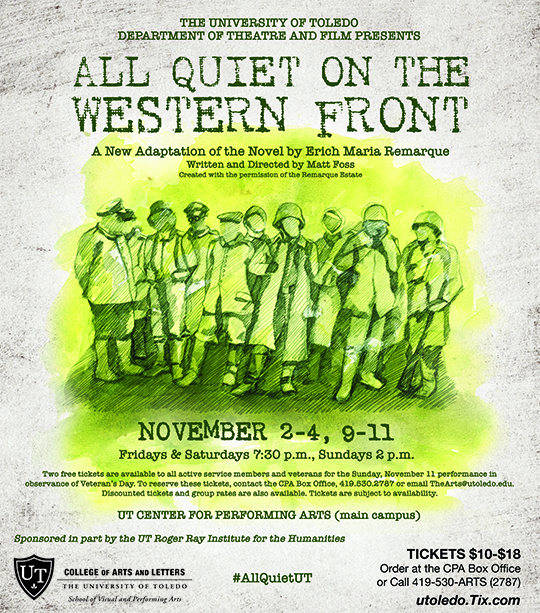 For more information on the sale, contact Lynn Brand, president of the Satellites, at lynn.brand@utoledo.edu. “If you put work on a page, you are a writer,” said Leslie Welch, dispelling the notion of an aspiring writer. The young adult author will share insights and provide encouragement when she visits the University Tuesday, Nov. 6, for a book signing and writing workshop. 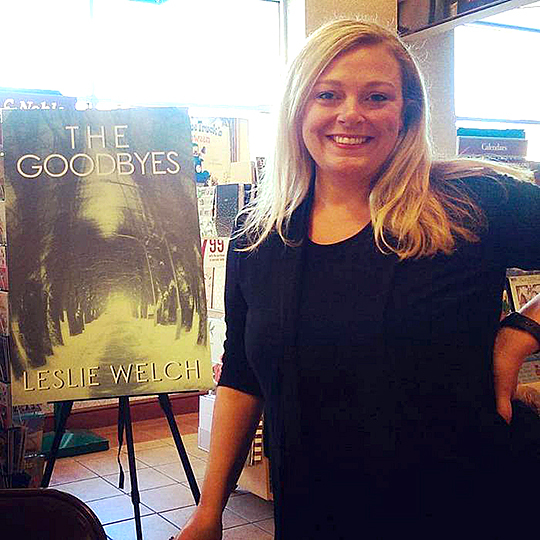 Welch is the author of the acclaimed debut novel “The Goodbyes.” The 2016 book is about unrequited love that inspires a musician to stardom — and the power of goodbye. She will sign books at the Barnes & Noble University Bookstore from noon to 2 p.m. Following the book signing, Welch will conduct a writing workshop in Carlson Library Room 2024 from 3:30 to 5:30 p.m. on “How to Draft Your Novel.” She will discuss starting a log line, building a plot, creating memorable characters, developing a platform, and finishing your first draft. The book signing and workshop are part of the University’s involvement in National Novel Writing Month (NaNoWriMo). The November event is a challenge to write 50,000 words in 30 days. “NaNoWriMo is a fantastic resource for all writers because you have to make a lot of compromises to get it done, and it forces you into a creative state you couldn’t otherwise access with unlimited time,” said Welch, who has participated in the event the past 13 years. Welch was born in Toledo and moved to Philadelphia in her preteen years. She graduated from Penn State and resides in the Washington, D.C., area. More information about NaNoWriMo and Welch’s visit can be found at the University Libraries website. Learn more about Welch at the author’s website. To register for the writing workshop, , or to participate in NaNoWriMo, contact Lucy Duhon, associate professor in University Libraries, at lucy.duhon@utoledo.edu or 419.530.2838. The University of Toledo Medical Center has worked with the Creating Healthy Communities Program at the Toledo-Lucas County Health Department and the Lucas County Women, Infants and Children Program to outfit a revamped lactation room to help new mothers return to work while continuing to breastfeed their children. UT Medical Center’s updated lactation room is located in Dowling Hall Room 0254. Research has shown babies who are breastfed have lower risks of several short- and long-term health problems, while mothers who breastfeed can lower their risk of breast cancer and hypertension. Mothers also are more likely to return to work when they have an employer that supports their decision to continue to provide breastmilk for their baby. The Fair Labor Standard Act requires employers to provide break time and space for nursing mothers to express their milk. Abodeely said UTMC and The University of Toledo have embraced this to the benefit of their employees, students and families. 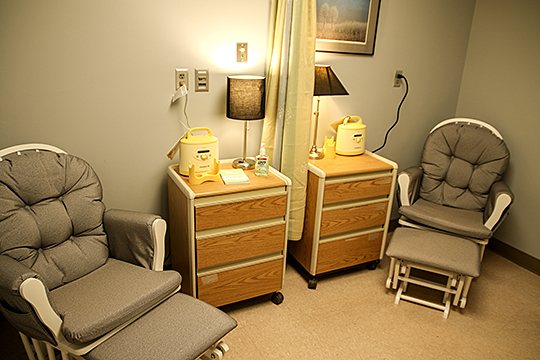 UTMC’s updated lactation room is located in Dowling Hall Room 0254. The upgrades were completed in part through a Creating Healthy Communities grant from the Ohio Department of Health. UTMC also provided support. Monecca Smith, chief nursing officer at UTMC, said a survey of students and employees clearly demonstrated there was a need for an improved location where women can pump breast milk. “We felt it was important to give our employees a nice, quiet, cozy space to decompress from the stressors of their job. Equally, we want to give them flexible break time so they can continue to offer the benefit of breastfeeding to their children while working,” Smith said. The room can be divided by a curtain to allow privacy for two women at a time. Each side has been equipped with a glider rocker, drawers with tubing and other supplies, and a hospital-grade breast pump. There’s also a refrigerator to store breast milk and a microwave for sterilizing pump parts. The room is open to all employees and does not need to be booked in advance. UTMC and the Toledo-Lucas County Health Department are currently collecting feedback from University employees about the new room. There is a second lactation room on Health Science Campus in Dowling Hall Room 2319. • Catharine S. Eberly Center for Women, Tucker Hall Room 0168. • University Counseling Center, Main Campus Medical Center Room 1550A (usage of this room can be scheduled in person or by calling 419.530.2426). • Thompson Student Union Room 2574 (usage of this room needs to be scheduled in advance by visiting Thompson Student Union Room 2525 or calling 419.530.2931). A marketing professional experienced in higher education branding and crisis communications will join The University of Toledo to lead the Office of University Marketing and Communications. 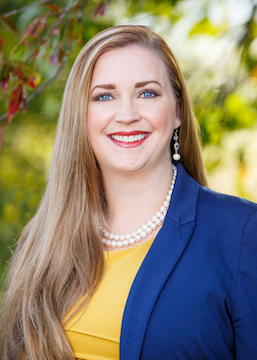 Dr. Adrienne King, vice president of university advancement for Murray State University in Murray, Ky., will join UT Jan. 7 as associate vice president of marketing and communications. At Murray State, King has led the branding, marketing and communication, alumni relations and development teams, as well as the Town & Gown Partnership Program since 2015. Under her leadership, the university completed a comprehensive marketing plan to increase the academic perception of the institution and strategically changed the academic profile of incoming students, grew private support by an average of 47 percent, and tripled the size of the university’s alumni association. Prior to Murray State, King held similar leadership positions for several higher education institutions as the director of marketing and communications for Idaho State University, director of relations and communications for West Virginia University Institute of Technology, and director of marketing for University of Charleston. King’s previous marketing teams have won more than 20 regional and national awards from organizations such as the Public Relations Society of America and the Council for Advancement and Support of Education for their work on recruitment initiatives, crisis communications, social media campaigns and fundraising/crowdfunding projects. King has a doctor of education degree in educational leadership in higher education administration and a master’s degree in integrated marketing communications from West Virginia University, and bachelor’s degrees in graphic design and advertising and public relations from Marietta College. She also is a graduate of the 2018 Leadership America program, a national executive leadership program designed for senior-level women who represent the broadest spectrum of professional, cultural, geographic and ethnic diversity. 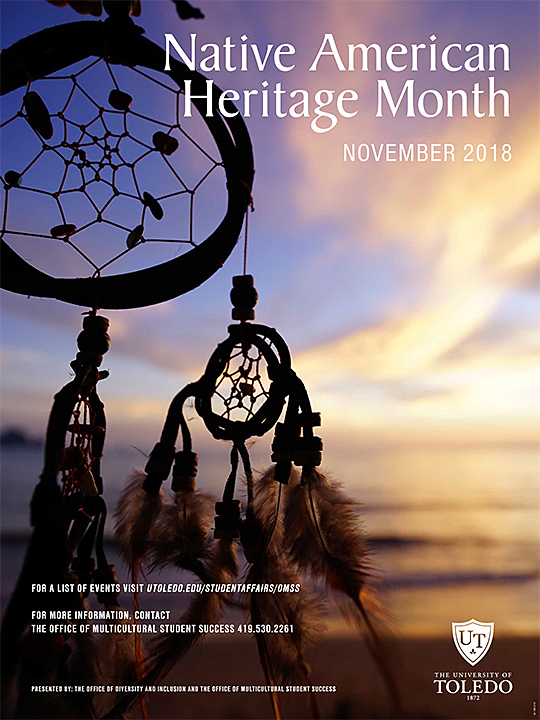 A talk by a modern medicine woman, a chance to make a dream catcher, and a film screening are some of the events that will take place at The University of Toledo in November for Native American Heritage Month. Ayres will give the keynote address, “Indigenous Healing for Modern Times,” Wednesday, Nov. 14, at 5 p.m. in Thompson Student Union Room 3018. “Healing is the inward journey back to your divine self: The body, mind and heart are various paths to your center,” Ayres wrote on her Facebook page. She is an expert in Native American spirituality and runs a healing practice in Sylvania, Ohio. • Monday, Nov. 5 — Native American Heritage Month Kickoff: Three Sister Soup Tasting, 11 a.m. to 2 p.m. in the Thompson Student Union Trimble Lounge. Stop by to sample the soup that is a combination of beans, corn and squash, foods traditionally grown by many Native American tribes. • Wednesday, Nov. 7 — Native American Heritage Month Diversity Dialogue, 5:30 p.m., Thompson Student Union Room 2584. The discussion will focus on issues that affect Native Americans and how these issues are relevant today in multiple marginalized communities. • Thursday, Nov. 15 — Create Your Own Dream Catcher, noon to 2 p.m., Thompson Student Union Trimble Lounge. Learn the symbolism of the dream catcher and make your own protective charm. • Wednesday, Nov. 28 — Film Screening, “Reel Injun,” 6 p.m., Memorial Field House Room 1200. The 2009 Canadian documentary explores the portrayal of Native Americans in film. The 85-minute film traces how images of Native Americans in cinema have influenced understanding and misunderstanding of their culture and history. For more information on these events, contact the UT Office of Multicultural Student Success at 419.530.2261 or omss@utoledo.edu.